Asked last month about his campaign for a third term, Gov. 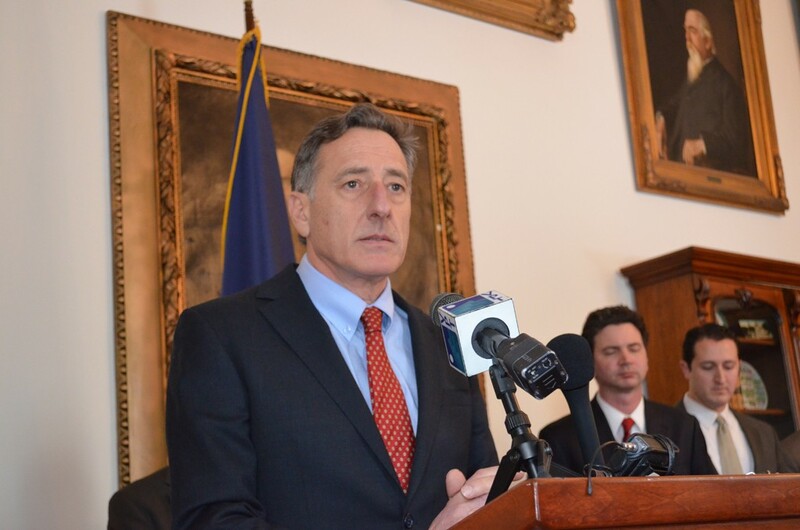 Peter Shumlin responded the way he usually does: with an air of practiced nonchalance. "Believe it or not, I don't wake up in the morning thinking about a reelection campaign," he said at a Montpelier press conference. "I'm not focused on fundraising for my campaign." Well, someone on Team Shumlin sure is. On Monday, the gov announced he'd raised nearly $329,000 in the past eight months, pushing his campaign war chest a smidge over the million-dollar mark. Just as important for Shumlin: The only potential challenger to file a mandatory fundraising and spending report by Monday's deadline was former Republican state auditor and senator Randy Brock, who Shumlin handily defeated in 2012. And Brock's new report only included expenses related to his last campaign. Despite his claims to the contrary, the governor quite clearly is focused on fundraising, his filing shows — and that has a lot to do with his dearth of opponents. On the very morning Shumlin uttered his "I don't wake up in the morning" remark, his campaign sent an email blast to its list of supporters asking for "$10, $25 or $50" contributions. A mere six days before that, Shumlin had traveled to D.C. for a spate of fundraisers benefiting the Democratic Governors Association, including one featuring President Barack Obama. While in town, Shummy picked up checks addressed to his own campaign account, totaling at least $16,000, according to Monday's filing. Two days before, he took an unannounced trip to Boston, where he wined and dined Bay State donors at Stella, an upscale Italian joint in the South End. Shumlin's campaign raked in at least $13,000 that day. And Stella didn't do too bad, either. The tab came to $742.26. Indeed, the takeaway from Shumlin's latest fundraising report is that the majority of his campaign cash comes from big-money donors who live outside Vermont. Many of them contributed the maximum allowed by law, which is $2,000 this cycle, while still others circumvented those limits by giving through their companies and family members. More interesting than how much Shummy raised, however, is how little he spent on fundraising during those same eight months: just $19,972. By leveraging his role as chairman of the DGA, the gov managed to hold fundraisers from D.C. to Las Vegas to San Francisco without spending a dime of his own campaign cash. Pretty much his only campaign expenses during that time were cell phone bills, online processing fees and $8,000 in payments to fundraiser Erika Wolffing. The rest — airfare, hotel rooms, etc. — came courtesy of the DGA, which raises most of its money through five- and six- figure donations from big corporate and union donors. For instance, on November 19 Shumlin's official appearance schedule listed him as, "In New York City for DGA." When Seven Days inquired about his activities at the time, DGA spokesman Danny Kanner said that Shumlin "will be in New York for a finance luncheon" and that the DGA would cover his travel expenses. "It's a meeting with prospective donors," Kanner elaborated. That very day, according to Shumlin's most recent filing, the governor managed to raise $26,000 for his own campaign. The day before, he took in another $4,500 from New Yorkers. Among the donors? High-powered lobbyist Heather Podesta, real estate scion Howard Milstein and Universal Remote Control founder Chang Park, who's contributed hundreds of thousands of dollars to organizations devoted to, um, getting money out of politics. Oh, and let's not forget John Zuccotti, the real estate tycoon whose eponymous Lower Manhattan park played host to the Occupy Wall Street crowd more than two years ago. Zuccotti and his wife, Susan, each donated $2,000 to the Shumlin campaign that day — as did four companies affiliated with Zuccotti's Brookfield Financial Properties. Three other Zuccottis — John Andrew, Margaret and Milena — each contributed a thousand apiece to Shumlin in the two months that followed. So did all those donors just happen to slip the gov a check at a "finance luncheon" benefiting the DGA? Or was it actually a Shumlin for Governor fundraiser, paid for by the DGA? If the latter, according to Vermont law, it would have to be reported as an in-kind contribution to the Shumlin campaign. Perhaps tellingly, none of those who contributed to Shumlin's campaign that day contributed to the DGA, according to that organization's 2013 IRS filing. The Shumlin campaign did not respond to requests for comment. Assistant Attorney General Eve Jacobs-Carnahan declined to weigh in on the situation. Either way, Shumlin's political apparatus and the DGA appear inextricably linked. The governor's former chief of staff, Bill Lofy, serves as a senior advisor to the DGA and continues to advise him. And Wolffing, Shumlin's longtime fundraiser, left her job as deputy labor commissioner in December to become a finance consultant for both the DGA and the Shumlin campaign. That raises the question of whether Wolffing raises money on Shumlin's behalf through the DGA, which can accept unlimited contributions, with the understanding that such money would be invested in Shumlin's campaign if the going gets tough this fall. The DGA spent more than a million dollars backing the gov's first run for office in 2010. There's no shortage of donors who play in both sandboxes. Billionaire hedge fund manager Tom Steyer, for instance, contributed $250,000 to the DGA at the end of last year. Steyer, a staunch environmentalist, has pledged to spend more than $100 million on Democratic campaigns this season, prompting some pundits to refer to him as a liberal version of the Koch brothers. Steyer has also steered thousands to Shumlin's reelection campaign. According to the governor's latest filing, Steyer and his family spent nearly $5,100 catering a San Francisco fundraiser for Shummy on September 30 — the day he was scheduled to be heading back to Vermont from a trip to China and Vietnam. The gov's campaign collected more than $20,000 from Californians in the days leading up to the Steyer fundraiser. While Shumlin often rails against U.S. Supreme Court rulings that weakened the nation's campaign finance laws, he seems to see nothing wrong with flagrantly flouting Vermont's own limits. Like Zuccotti, several other Shumlin donors have exceeded Vermont's current limit of $2,000 per donor, per election cycle. On the day Shumlin traveled to D.C. last month, Massachusetts auto dealer Ernie Boch, Jr., gave the governor $2,000 from his own checkbook — and two more contributions of the same amount from a trust and an LLC. Last July, Boch's father, Ernie Sr., gave another $2,000, as did Subaru of New England, which is owned by the family. Also in D.C., billionaire banker Leonard Abess and his wife, Jayne, gave Shumlin's campaign at least $8,000 through various entities they control. Abess made his fortune as the owner of First National Bank of Florida and appears to own property in Vermont. Another multi-donor is Ariel Quiros, who co-owns Jay Peak Resort and Burke Mountain, and is engaged in the $600 million Northeast Kingdom Economic Development Initiative. Last Wednesday, the Florida-based businessman gave Shumlin $2,000 from his own pocket and another $8,000 from four Miami companies he controls. Quiros' business partner, Bill Stenger, donated $2,000 last November. Last year, Stenger and Quiros paid to fly Shumlin to Miami and Asia to drum up foreign investors for their development projects through the EB-5 investor visa program. In fact, Shumlin was returning from such a trip when Steyer held his San Francisco fundraiser last September. Stenger's most recent campaign contribution came last November, when he was invited to a downtown Burlington fundraiser held by commercial real estate developer Bobby Miller. That event, which included many of the state's top business leaders, brought in at least $36,000, according to Shumlin's latest filing. That's not including the $8,000 the extended Miller clan donated on a single day last month, nor the $1,000 Bobby Miller's wife, Holly, spent catering the November event. What was Shumlin's response when Seven Days caught wind of the Miller fundraiser last December? You guessed it: "As you can imagine, I'm focused on governing the state of Vermont, not raising funds." Asked at the time who else was holding fundraisers on his behalf, Shumlin at first demurred, saying that it would be clear when he filed his next fundraising report. Pressed, Shumlin finally agreed, saying he would "be happy to tell you exactly where I had fundraisers" when the next reporting deadline arrived. Asked last week whether the governor would honor his commitment, Wolffing said that the legally required campaign finance filing "is all I or the campaign will have for you on this." She and other Shumlin staffers ignored repeated requests for an explanation, nor would they put the governor on the phone with Seven Days. Perhaps he was busy governing. Oh, wait. He's on vacation in Dominica. Shumlin's not the only one relying upon out-of-state donors to fill his campaign coffers. Democratic Attorney General Bill Sorrell took every last dime of the $26,100 he raised in the past eight months from people outside the Green Mountain State. And, like Shumlin, he did the bulk of his fundraising at events sponsored by a partisan national political organization — in his case, the Democratic Attorneys General Association. You may remember DAGA from August 2012, when a super PAC it financed spent $200,000 on an ad campaign supporting Sorrell over fellow Democrat T.J. Donovan, the Chittenden County state's attorney. Nearly all of Sorrell's contributions this time around came from DAGA's membership, which includes national attorneys, lobbyists and former attorneys general. Sorrell says he "pass[ed] around envelopes" soliciting contributions at DAGA's December meeting in D.C. and held a fundraiser at its January meeting in Orlando. DAGA pays for Sorrell's airfare and lodging when he attends its events. So why exactly are DAGA's members so keen on talking to Vermont's attorney general? "By and large, they represent clients or organizations now in interactions with AGs," he explains. "They get to talk with AGs in social settings or appear on panels on issues. And frequently a matter will come up and they will ask for a meeting to discuss." For example, Sorrell explains, former Mississippi attorney general Mike Moore and former Washington State attorney general Rob McKenna joined the Vermonter at the Orlando fundraiser. Moore donated $1,000 to Sorrell's campaign that day, while McKenna's firm donated $500 a week later. Then the two asked for a meeting in Vermont to discuss their opposition to e-cigarettes, which Sorrell granted. "I'm sure someone was paying them to be there and have the meeting," Sorrell says. "But these are people who I've served with and are friends of mine. And I'm not for sale for $500." While it may look like it, Sorrell maintains, "It's not a pay-to-play situation. If there was some other AG who didn't contribute to my campaign and asked for a meeting on an issue, I typically take those meetings." OK, but is it appropriate to accept campaign contributions from those who may be seeking support from the Vermont Attorney General's Office? "I've got a very clear conscience," Sorrell says. "They move in AG circles. They interact with AGs on behalf of clients." "I don't think there's an AG in the country who's tried to limit the influence of big money in politics more than I, including arguing all the way to the Supreme Court," he adds, referring to his failed attempt in 2006 to defend Vermont's strict campaign finance limits. "I wish there was less money than more in our political campaigns." The original print version of this article was headlined "Traveling Salesman"